Zlatan Ibrahimovic scored his tenth goal in nine matches as Manchester United eased to victory over West Brom. The former Sweden international headed home from a brilliant Jesse Lingard delivery after only five minutes to put the visitors ahead. Ibrahimovic struck again just after the break when his effort from inside the box went in off Baggies defender Craig Dawson. United are now unbeaten in 10 matches in all competitions and have drawn level on points in the Premier League with fifth-place Tottenham, who play Burnley on Sunday. The Baggies remain in seventh place and are now seven points off the European places. Ibrahimovic's double at the Hawthorns brings the striker to 16 goals for the season - 11 more than any of his team-mates. Lingard will take huge credit for the opening goal, though, after his sublime cross from the right landed perfectly for the Swede, who headed down past Ben Foster from eight yards out. His second goal was teed up by captain Wayne Rooney and Ibrahimovic managed to worm his way into the box before striking with his right foot on 55 minutes. Rooney, meanwhile, must wait again to equal Sir Bobby Charlton's record of 249 goals for the club, after he saw a first-half strike from outside the area forced on to the bar by Foster. West Brom have won three of their past six meetings with United but they could not stop their opponents from dominating possession on Saturday evening. Tony Pulis' side managed one shot on target all match, when Chris Brunt fired at David de Gea in the first half. Salomon Rondon scored three headers in his side's mid-week victory over Swansea but on this occasion he could only nod wide from Matt Phillips' cross. It means the Baggies miss out on equalling their Premier League club record of four consecutive home victories. United manager Jose Mourinho was forced to defend Marcos Rojo following Wednesday's win over Crystal Palace, after the defender escaped with a yellow card for a two-footed lunge - the second incident of its kind this month. Defender Rojo went in the book again against West Brom after clashing with Rondon. The pair were booked for dissent after the Baggies striker appeared to push his opponent in the chest, before slapping him across the face. Ibrahimovic may have been lucky to escape with only a yellow card - his sixth of the season - when he barged Dawson off the ball with some force - much to the disdain of the home fans. And in the latter stages of the game Chris Brunt took out an on-rushing Marcus Rashford and was also booked. When asked about Ibrahimovic's punishment after the match, Pulis replied: "Ask the 28,000 fans what they thought of it." Although Ibrahimovic grabbed the goals, Paul Pogba's influence was strong throughout. The United forward made the most shots (3), the most passes (89) and had the most touches (109) overall. Manchester United are now unbeaten in eight Premier League games (W4 D4), their longest run without defeat in the competition since 1 January 2015 (10 games). Only Ruud van Nistelrooy netted more goals in his first 16 Premier League appearances (12) than Ibrahimovic [11, level with Robin van Persie and Cole]. West Brom boss Tony Pulis: "We gave them a poor goal at the start, which was disappointing. It knocked us a little bit flat. "At half-time I said 'let's make sure we stay in the game, we'll grow into it' and I thought we would. The last thing we wanted was that second goal. It was very fortuitous. "We've played against a team who have found some form and you can see why." Manchester United manager Jose Mourinho on Ibrahimovich: "He is the kind of player who doesn't need to prove anything to anyone but when he decided to come to England for the last period of his career - to the most difficult championship in the world - I think he proved he is a superman in his mentality. "What he is doing at 35 is a dream for every striker of 25 in the Premier League. I need to give him a rest. Now we have a little rest for the first time. It is not just him but everybody." Manchester United welcome former manager David Moyes back to Old Trafford when Sunderland visit on Boxing Day, while West Brom travel to Arsenal. 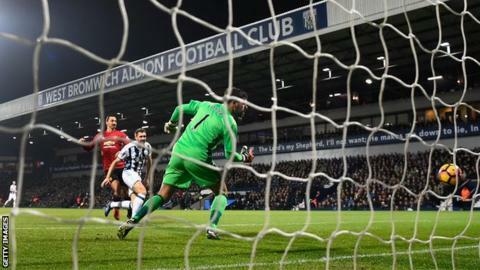 Match ends, West Bromwich Albion 0, Manchester United 2. Second Half ends, West Bromwich Albion 0, Manchester United 2. Corner, Manchester United. Conceded by Gareth McAuley. Attempt blocked. Marcus Rashford (Manchester United) right footed shot from the left side of the box is blocked. Assisted by Zlatan Ibrahimovic. Substitution, Manchester United. Chris Smalling replaces Ander Herrera. Offside, West Bromwich Albion. Hal Robson-Kanu tries a through ball, but Salomón Rondón is caught offside. Chris Brunt (West Bromwich Albion) is shown the yellow card for a bad foul. Marcus Rashford (Manchester United) wins a free kick on the right wing. Foul by Chris Brunt (West Bromwich Albion). Substitution, Manchester United. Marouane Fellaini replaces Wayne Rooney. Substitution, West Bromwich Albion. Jonathan Leko replaces Nacer Chadli. Substitution, West Bromwich Albion. Hal Robson-Kanu replaces Matt Phillips. Attempt missed. Paul Pogba (Manchester United) right footed shot from outside the box is too high. Assisted by Zlatan Ibrahimovic. Substitution, Manchester United. Marcus Rashford replaces Jesse Lingard. Foul by Matteo Darmian (Manchester United). Nyom (West Bromwich Albion) wins a free kick on the right wing. Substitution, West Bromwich Albion. James Morrison replaces Craig Dawson. Jesse Lingard (Manchester United) wins a free kick on the right wing. Foul by Jonas Olsson (West Bromwich Albion). Corner, West Bromwich Albion. Conceded by Wayne Rooney. Attempt blocked. Matt Phillips (West Bromwich Albion) right footed shot from the centre of the box is blocked. Foul by Phil Jones (Manchester United). Salomón Rondón (West Bromwich Albion) wins a free kick in the attacking half. Attempt saved. Paul Pogba (Manchester United) right footed shot from outside the box is saved in the centre of the goal. Matteo Darmian (Manchester United) wins a free kick on the left wing. Foul by Matt Phillips (West Bromwich Albion). Offside, West Bromwich Albion. Matt Phillips tries a through ball, but Darren Fletcher is caught offside. Foul by Paul Pogba (Manchester United). Craig Dawson (West Bromwich Albion) wins a free kick on the right wing. Salomón Rondón (West Bromwich Albion) is shown the yellow card. Marcos Rojo (Manchester United) is shown the yellow card. Offside, West Bromwich Albion. Salomón Rondón tries a through ball, but Matt Phillips is caught offside. Attempt missed. Gareth McAuley (West Bromwich Albion) header from the centre of the box misses to the right. Assisted by Chris Brunt with a cross following a set piece situation. Jesse Lingard (Manchester United) is shown the yellow card. Hand ball by Antonio Valencia (Manchester United). Goal! West Bromwich Albion 0, Manchester United 2. Zlatan Ibrahimovic (Manchester United) right footed shot from the left side of the box to the bottom right corner. Assisted by Wayne Rooney. Attempt saved. Paul Pogba (Manchester United) right footed shot from more than 35 yards is saved in the top centre of the goal. Assisted by Michael Carrick. Ander Herrera (Manchester United) wins a free kick in the attacking half. Foul by Claudio Yacob (West Bromwich Albion).